AmeriCommerce, a full-service e-commerce platform, today announced it is introducing AmeriCommerce Payments to all its merchants. The platform’s unique pricing model already allows for unlimited transactions and order volume regardless of plan level. AmeriCommerce Payments will introduce new pricing tiers that will promote even more incentives for volume growth. E-commerce merchants will be able to take advantage of simple payments starting today. Understanding complex credit card processing statements is a daunting task for a reason. Several processors charge a constant array of shifty fees that are designed to take advantage of you. Not to mention e-commerce platforms now even penalize their customers for increasing sales volume by forcing users to more expensive plan levels. When will e-commerce platforms stop asking for more money from merchants? When will they stop asking investors to fund their unsustainable ways? Entrepreneurs can’t seem to catch a break. Until now. With AmeriCommerce Payments, merchants can now enjoy the sweet smell of success. Anyone using the AmeriCommerce platform can start accepting payments within minutes of signing up while being rewarded with a consolidated view of all their transaction details in one place. World-class fraud prevention and risk management services come included free, that’s right – free, with every account. This reduces the burden for third party fraud prevention apps and unneeded vendors who all charge monthly fees/percentages. Plus, the simplified pricing structure of AmeriCommerce Payments is sure to pass the sniff test. AmeriCommerce Payments will give incentives to merchants based on their AmeriCommerce subscription plan level which is much more “sense-able" to the e-commerce community. 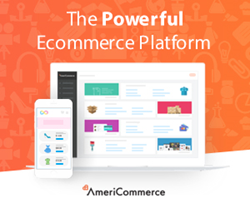 AmeriCommerce is one of the only remaining e-commerce platforms that offers unlimited sales volume at every plan level. Smaller plans can be approved for a simple 2.9% + 30¢ per transaction while mid-tier plans receive a lower rate of 2.6%. Larger plan levels will be rewarded the most by receiving pricing as low as 2.4%. Higher volume merchants can always get a negotiated rate based on volume history as well. Regardless of what tier the account falls in, there are no monthly fees, contracts or commitments meaning merchants pay as they go for only what’s needed. If that’s not enough to raise an eyebrow, there’s zero penalty if merchants choose to use a separate payment gateway – another silent but deadly trend you see among those overrated “billion-dollar” platforms. AmeriCommerce is a PCI certified e-commerce software platform serving thousands of merchants since 2005. Whether you need one online store or multiple stores, AmeriCommerce has the tools to sell stuff online, Facebook, Twitter, mobile, blogs and across the web. With more than $5 billion processed, AmeriCommerce is a stable and reliable solution for competitive internet retailers and merchants who need smart tools for a complex industry. By staying passionate about selling stuff online and fostering a loving and deep partnership with our customers, AmeriCommerce is the e-commerce software with heart. Do you love your store? Learn more about AmeriCommerce at http://www.americommerce.com.